in special make-up effects working on local independent productions. Within a few years he was finding work as a lab tech and on set make-up artist on projects like A NIGHTMARE ON ELM STREET, PART 2; THE TEXAS CHAINSAW MASSACRE 2, and ROBOCOP. Bart was a cofounder of the make-up effects studio, MIXON AND ELLIS FX [ME-FX]; who for four years created make-ups and creatures for such projects as MEN IN BLACK, PETER BENCHLEY'S THE BEAST, and FARGO. In recent years, Bart has served as a project coordinator and/or make-up artist on THE GRINCH, PLANET OF THE APES, MIB 2, THE RING, THE CAT IN THE HAT, and HELLBOY. Bart has been a member of Make-up Artists Local 706 since 1994, and is a SAG puppeteer. Read an interview with Bart here. 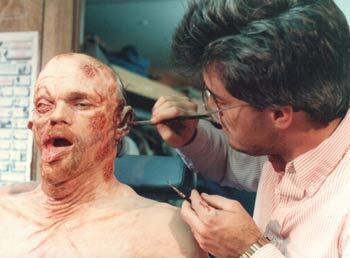 Bart puts the finishing touches on Rob Bottin's "Melting Man" make-up from ROBOCOP. 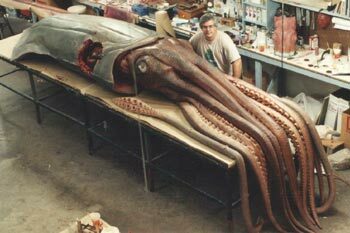 Bart with the "little" dead squid prop from the mini series of PETER BENCHLEY'S THE BEAST; created by his shop, ME-FX.